A day or two ago I have seen Jeff Vandermeer's list of 2009 recommended books at Locus Online. It's an excellent list imho and while I have started and not yet finished - but plan to sooner rather than later - several of the books there (Palimpsest, Red Tree, The Sad Tale of Brothers Grossbart, Last Days, The Other City) - and I did not like Boneshaker though Robert did like it quite a lot, while I thought Far North good but not as great as Mr. Vandermeer thought, the overall quality of the novels recommended is astonishingly high and books like Yellow Blue Tibia, The Babylonian Trilogy, The Other Lands, Best Served Cold, The Steel Remains deserve all the praise Mr. Vandermeer lavishes on them. 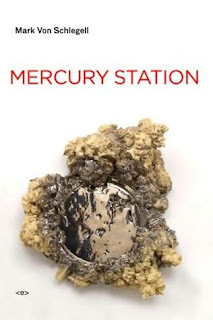 I linked above to all FBC reviews of the works mentioned, some written by Robert, some by me, some joint by the two of us, so you can see our takes; the list motivated me to bump up the "started to read later" ones in my reading queue, so I finished Mercury Station by Marc von Schlegell today and will go on to Palimpsest too. Go and check out this list!! "Venusia truly made my head spin and I felt dizzy though sitting on a bench when I was trying to imagine the landscape of the novel. I enjoyed it overall - weird is too banal a word for this one - both in style (modernistic a la MJ Harrison) and in content (from sentient plants to multidimensional twisting of reality) - the drawback is that you have to immerse yourself and not nitpick." Well, today I finished Mercury Station and while I am far from being able to write a coherent review and I invite you to read Mr. Vandermeer's one linked above which gives you some - but only some - idea about what the novel is about, I have to say that this one is closer to what one would call "essential sf" than things usually labeled such; it is innovative in so many ways, and while Venusia was weird but with a sort-of-clear-plot/action and I have not decided yet if Mercury Station truly makes sense plot-wise, the things thrown in almost casually from a chrono-dynamics theory, to Quantum computers, to Medieval imagery and action combined with 22nd century Solar System intrigue, all in a package that will make you a bit dizzy but still compel you to turn pages, should make this one a must for any sf-lover. Highly, highly recommended! In a smaller tidbit, my count of read novels from my 2010 Anticipated List reached 19 out of 90+ and I have 4-5 more in the reading queue so to speak; I put short takes/ratings for all 19 in the updated post linked above, while we have seven full FBC reviews from them so far with at least 3 more planned this coming week, and 2 more next week. Despite the mixed online reviews, I still rate The Left Hand of God by Paul Hoffman as top alongside The Folding Knife by KJ Parker, with Black Hills by Dan Simmons and City of Ruin by Mark Newton very close there too.